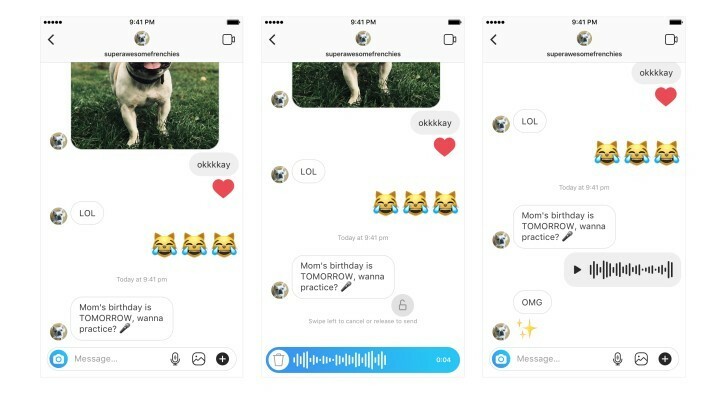 Instagram Direct, the area of the service where you chat with your friends either one-on-one or in group settings, is getting a new feature today. You should file this one under the "how could it possibly have taken this long?" category, because we're talking about voice messages. It's basically a carbon copy of the walkie-talkie like system that Facebook Messenger has had for the past five years. It works exactly the same, it has the same limitations, everything. And since Facebook owns Instagram, it's baffling that it took this long to incorporate the feature. Perhaps Instagram has recently been too busy aping Snapchat to have the time to look in Facebook's own backyard. Anyway, starting today you should see a new microphone icon in your group or one-to-one chats in Direct. Hold that and you can record voice messages up to one minute in length. The instant you stop holding the mic icon the voice message will be sent. If you want to discard it instead, just move your finger to the trash icon that shows up while you're recording. That's it. The voice messages won't expire, and allow for asynchronous communication through voice, for the moments when texting isn't convenient - or you feel you'd be able to express more thoughts more quickly by talking. Or for those times you think an emotion is better captured through speaking than writing. Whatever the use case, the new feature should be live in Instagram for both Android and iOS. after the last update .. there is no sound notifications for msgs .. why ??? I hate when people send me voice messages because I can't recognize people's voices.